Ryan Thewes, a native of southern Indiana, graduated from the Ball State University College of Architecture and Planning in 2000. While in school, Ryan studied the architecture of Frank Lloyd Wright, which made a strong impression on his development as a designer. He felt a kinship with Wright’s ideas on architecture, which seemed to closely resemble his own. Ryan was inspired by Wright’s bold use of geometry, veneration of nature and his ability to integrate a building with its site. Wright called his work “Organic Architecture,” which came from his belief that a building’s essence or character should derive from the design process in the same way a living organism grows from a seed–logically and naturally from the inside out. After Ryan graduated, he broadened his education of organic architecture by working for the late Don Erickson, an architect in Chicago, and Robert Green, an architect practicing in the Atlanta area; both successful former apprentices of Frank Lloyd Wright. In 2002, Ryan accepted a job with architect Bart Prince in Albuquerque, New Mexico. Prince, well known for his fantastic if not surreal designs often featured in magazines such as Architectural Digest, had been an apprentice, friend and design partner of the maverick architect and educator Bruce Goff. Although Prince and Goff were both influenced by the work of Wright, they translated many of his principles in entirely new and dramatic directions. Ryan’s apprenticeship with Prince allowed him to expand his own vision of organic architecture—starting his first architectural commissions while living in New Mexico. 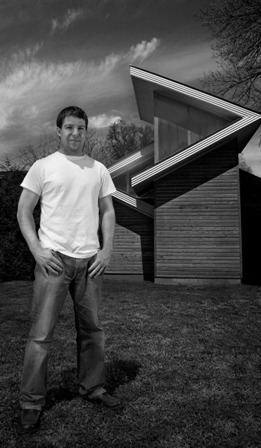 In 2006, Ryan and his wife Shay, moved to Nashville, Tennessee, where he set up his own architectural practice. Ryan continues to press the boundaries with award winning Organic and Modern structures that are unique to the area. His designs have received national as well as world wide attention and have been featured in many online and print media sources. He has also been recognized widely for his advancements in green construction and the green building industry, with his focus on building science and performance. Ryan is a licensed architect in the states of Tennessee, Kentucky, and Georgia and is a member of the National Council of Architects Registration Board.